I cannot pretend to say what occurred on the 14th of April last at No. 17, Badderly Gardens. Put down in black and white, my surmise might seem too crude, too grotesque, for serious consideration. And yet that something did occur, and that it was of a nature which will leave its mark upon every one of us for the rest of our lives, is as certain as the unanimous testimony of five witnesses can make it. I will not enter into any argument or speculation. I will only give a plain statement, which will be submitted to John Moir, Harvey Deacon, and Mrs. Delamere, and withheld from publication unless they are prepared to corroborate every detail. I cannot obtain the sanction of Paul Le Duc, for he appears to have left the country. It was John Moir (the well-known senior partner of Moir, Moir, and Sanderson) who had originally turned our attention to occult subjects. He had, like many very hard and practical men of business, a mystic side to his nature, which had led him to the examination, and eventually to the acceptance, of those elusive phenomena which are grouped together with much that is foolish, and much that is fraudulent, under the common heading of spiritualism. His researches, which had begun with an open mind, ended unhappily in 130dogma, and he became as positive and fanatical as any other bigot. He represented in our little group the body of men who have turned these singular phenomena into a new religion. Mrs. Delamere, our medium, was his sister, the wife of Delamere, the rising sculptor. Our experience had shown us that to work on these subjects without a medium was as futile as for an astronomer to make observations without a telescope. On the other hand, the introduction of a paid medium was hateful to all of us. Was it not obvious that he or she would feel bound to return some result for money received, and that the temptation to fraud would be an overpowering one? No phenomena could be relied upon which were produced at a guinea an hour. But, fortunately, Moir had discovered that his sister was mediumistic—in other words, that she was a battery of that animal magnetic force which is the only form of energy which is subtle enough to be acted upon from the spiritual plane as well as from our own material one. Of course, when I say this, I do not mean to beg the question; but I am simply indicating the theories upon which we were ourselves, rightly or wrongly, explaining what we saw. The lady came, not altogether with the approval of her husband, and though she never gave indications of any very great psychic force, we were able, at least, to obtain those usual phenomena of message-tilting which are at the same time so puerile and so inexplicable. Every Sunday evening we met in Harvey Deacon’s studio at Badderly Gardens, the next house to the corner of Merton Park Road. Harvey Deacon’s imaginative work in art would 131prepare any one to find that he was an ardent lover of everything which was outré and sensational. A certain picturesqueness in the study of the occult had been the quality which had originally attracted him to it, but his attention was speedily arrested by some of those phenomena to which I have referred, and he was coming rapidly to the conclusion that what he had looked upon as an amusing romance and an after-dinner entertainment was really a very formidable reality. He is a man with a remarkably clear and logical brain—a true descendant of his ancestor, the well-known Scotch professor—and he represented in our small circle the critical element, the man who has no prejudices, is prepared to follow facts as far as he can see them, and refuses to theorize in advance of his data. His caution annoyed Moir as much as the latter’s robust faith amused Deacon, but each in his own way was equally keen upon the matter. And I? What am I to say that I represented? I was not the devotee. I was not the scientific critic. Perhaps the best that I can claim for myself is that I was the dilettante man about town, anxious to be in the swim of every fresh movement, thankful for any new sensation which would take me out of myself and open up fresh possibilities of existence. I am not an enthusiast myself, but I like the company of those who are. Moir’s talk, which made me feel as if we had a private pass-key through the door of death, filled me with a vague contentment. The soothing atmosphere of the séance with the darkened lights was delightful to me. In a word, the thing amused me, and so I was there. 132It was, as I have said, upon the 14th of April last that the very singular event which I am about to put upon record took place. I was the first of the men to arrive at the studio, but Mrs. Delamere was already there, having had afternoon tea with Mrs. Harvey Deacon. The two ladies and Deacon himself were standing in front of an unfinished picture of his upon the easel. I am not an expert in art, and I have never professed to understand what Harvey Deacon meant by his pictures; but I could see in this instance that it was all very clever and imaginative, fairies and animals and allegorical figures of all sorts. The ladies were loud in their praises, and indeed the colour effect was a remarkable one. “What do you think of it, Markham?” he asked. “It’s not a horse,” said he, rather testily—which was surprising, for he was a very good-humoured fellow as a rule, and hardly ever took himself seriously. “Very sorry, Deacon,” said I, for he really seemed to be annoyed. He laughed at his own irritation. “Yes, I had no difficulty with them. It was the unicorn which bothered me. However, there’s an end of it until to-morrow.” He turned the picture round upon the easel, and we all chatted about other subjects. Moir was late that evening, and when he did arrive he brought with him, rather to our surprise, a small, stout Frenchman, whom he introduced as Monsieur Paul Le Duc. I say to our surprise, for we held a theory that any intrusion into our spiritual circle deranged the conditions, and introduced an element of suspicion. We knew that we could trust each other, but all our results were vitiated by the presence of an outsider. However, Moir soon reconciled us to the innovation. Monsieur Paul Le Duc was a famous student of occultism, a seer, a medium, and a mystic. He was travelling in England with a letter of introduction to Moir from the President of the Parisian brothers of the Rosy Cross. What more natural than that he should bring him to our 134little séance, or that we should feel honoured by his presence? He was, as I have said, a small, stout man, undistinguished in appearance, with a broad, smooth, clean-shaven face, remarkable only for a pair of large, brown, velvety eyes, staring vaguely out in front of him. He was well dressed, with the manners of a gentleman, and his curious little turns of English speech set the ladies smiling. Mrs. Deacon had a prejudice against our researches and left the room, upon which we lowered the lights, as was our custom, and drew up our chairs to the square mahogany table which stood in the centre of the studio. The light was subdued, but sufficient to allow us to see each other quite plainly. I remember that I could even observe the curious, podgy little square-topped hands which the Frenchman laid upon the table. Harvey Deacon started in his chair. The Frenchman was moving his head slowly round and staring into the shadows which draped the walls. “They are, I suppose, upon the astral plane?” said Moir. “What is the advantage of the dark?” I asked. At first the darkness appeared to be absolutely pitchy, but in a few minutes our eyes became so far accustomed to it that we could just make out each other’s presence—very dimly and vaguely, it is true. I could see nothing else in the room—only the black loom of the motionless figures. We were all taking the matter much more seriously than we had ever done before. So we sat in silence and expected, staring out into the blackness in front of us. A clock ticked in the passage. A dog barked intermittently far away. Once or twice a cab rattled past in the street, and the gleam of its lamps through the chink in the curtains was a cheerful break in that gloomy vigil. I felt those physical symptoms with which previous séances had made me familiar—the coldness of the feet, the tingling 137in the hands, the glow of the palms, the feeling of a cold wind upon the back. Strange little shooting pains came in my forearms, especially as it seemed to me in my left one, which was nearest to our visitor—due no doubt to disturbance of the vascular system, but worthy of some attention all the same. At the same time I was conscious of a strained feeling of expectancy which was almost painful. From the rigid, absolute silence of my companions I gathered that their nerves were as tense as my own. And then suddenly a sound came out of the darkness—a low, sibilant sound, the quick, thin breathing of a woman. Quicker and thinner yet it came, as between clenched teeth, to end in a loud gasp with a dull rustle of cloth. “What’s that? Is all right?” someone asked in the darkness. Still the ticking in the hall. Still the breathing, deeper and fuller now, from the medium. Still the occasional flash, more welcome than ever, of the passing lights of the hansoms. What a gap we were bridging, the half-raised veil of the eternal on the one side and the cabs of London on the other. The table was throbbing with a mighty pulse. It swayed steadily, rhythmically, with an easy swooping, scooping motion under our fingers. Sharp little raps and cracks came from its substance, file-firing, volley-firing, the sounds of a fagot burning briskly on a frosty night. I had thought it was some delusion of my own, but all could see it now. There was a greenish-yellow phosphorescent light—or I should say a luminous vapour rather than a light—which lay over the surface of the table. It rolled and wreathed and undulated in dim glimmering folds, turning and swirling like clouds of smoke. I could see the white, square-ended hands of the French medium in this baleful light. “Shall we call the alphabet?” asked Moir. “Yes, you will do better,” said a voice. “It is not the medium, but it is the power which uses the organs of the medium,” said the strange, deep voice. We heard the creak and grate of a cab pulling up next door. There was an argument about the fare, and the cabman grumbled hoarsely down the street. The green-yellow cloud still swirled faintly over the table, dull elsewhere, but glowing into a dim luminosity in the direction of the medium. It seemed to be piling itself up in front of her. A sense of fear and cold struck into my heart. It seemed to me that lightly and flippantly we had approached the most real and august of sacraments, that communion with the dead of which the fathers of the Church had spoken. “Don’t you think we are going too far? Should we not break up this séance?” I cried. But the others were all earnest to see the end of it. They laughed at my scruples. “It is right and proper,” said the voice. “It is a religion, not a game,” said the cold, hard voice. It did, for my doubts had passed and only interest remained. “Have you pain in your life?” I asked. There was a pause, and the blackness seemed to grow blacker still, while the yellow-green fog swirled and smoked upon the table. “Any questions you would like to ask, Moir?” said Harvey Deacon. “But nothing could be more interesting than this,” said Moir. But the spell was broken. We asked and asked, but the medium sat silent in her chair. Only her 143deep, regular breathing showed that she was there. The mist still swirled upon the table. The room was blacker and more silent than ever. The same feeling of apprehension which had lain heavily upon me at the beginning of the séance was back at my heart once more. The roots of my hair were tingling. “It is working! It is working!” cried the Frenchman, and there was a crack in his voice as he spoke which told me that he also was strung to his tightest. The luminous fog drifted slowly off the table, and wavered and flickered across the room. There in the farther and darkest corner it gathered and glowed, hardening down into a shining core—a strange, shifty, luminous, and yet non-illuminating patch of radiance, bright itself, but throwing no rays into the darkness. It had changed from a greenish-yellow to a 144dusky sullen red. Then round this centre there coiled a dark, smoky substance, thickening, hardening, growing denser and blacker. And then the light went out, smothered in that which had grown round it. We heard it in the corner where the light had been, something which breathed deeply and fidgeted in the darkness. “It is all right. No harm will come.” The Frenchman’s voice was treble with agitation. It was Harvey Deacon’s voice, and then came the sound of a blow upon some hard object. And then … And then … how can I tell you what happened then? Some huge thing hurtled against us in the darkness, rearing, stamping, smashing, springing, snorting. The table was splintered. We were scattered in every direction. It clattered and scrambled amongst us, rushing with horrible energy from one corner of the room to another. We were all screaming with fear, grovelling upon our hands and knees to get away from it. Something trod upon my left hand, and I felt the bones splinter under the weight. “A light! A light!” someone yelled. My hand, by good luck, lit upon the handle as I groped about in the darkness. The hard-breathing, snorting, rushing creature tore past me and butted with a fearful crash against the oaken partition. The instant that it had passed I turned the handle, and next moment we were all outside and the door shut behind us. From within came a horrible crashing and rending and stamping. He flung open the door and we rushed in. She was there on the ground amidst the splinters of her chair. We seized her and dragged her swiftly out, and as we gained the door I looked over my shoulder into the darkness. There were two strange eyes glowing at us, a rattle of hoofs, and I had just time to slam the door when there came a crash upon it which split it from top to bottom. “Run, run for your lives!” cried the Frenchman. Another crash, and something shot through the riven door. It was a long white spike, gleaming in the lamplight. For a moment it shone before us, and then with a snap it disappeared again. We had taken refuge in the dining-room, and shut the heavy oak door. We laid the senseless woman upon the sofa, and as we did so, Moir, the hard man of business, drooped and fainted across the hearthrug. Harvey Deacon was as white as a corpse, jerking and twitching like an epileptic. With a crash we heard the studio door fly to pieces, and the snorting and stamping were in the passage, up and down, up and down, shaking the house with their fury. The Frenchman had sunk his face on his hands, and sobbed like a frightened child. Harvey Deacon sprang up. “Good heavens!” he cried. A terrible scream sounded through the house. He had thrown open the door and rushed out into the passage. At the end of it, at the foot of the stairs, Mrs. Deacon was lying senseless, struck down by the sight which she had seen. But there was nothing else. 147With eyes of horror we looked about us, but all was perfectly quiet and still. I approached the black square of the studio door, expecting with every slow step that some atrocious shape would hurl itself out of it. But nothing came, and all was silent inside the room. Peeping and peering, our hearts in our mouths, we came to the very threshold, and stared into the darkness. There was still no sound, but in one direction there was also no darkness. A luminous, glowing cloud, with an incandescent centre, hovered in the corner of the room. Slowly it dimmed and faded, growing thinner and fainter, until at last the same dense, velvety blackness filled the whole studio. And with the last flickering gleam of that baleful light the Frenchman broke into a shout of joy. And that was what befell on the 14th of April last at No. 17, Badderly Gardens. I began by saying that it would seem too grotesque to dogmatize as to what it was which actually did occur; but I give my impressions, our impressions (since they are corroborated by Harvey Deacon and John Moir), for what they are worth. You may, if it pleases you, imagine that we were the victims of an elaborate and extraordinary hoax. Or you may think with us that we underwent a very real and a very terrible experience. Or perhaps you may know more than 148we do of such occult matters, and can inform us of some similar occurrence. In this latter case a letter to William Markham, 146M, The Albany, would help to throw a light upon that which is very dark to us. Copyright © 2014 Mike Russell. Interested in another short story from the book, check out “Dunce” here. A powerful story of stark horror, and the dreadful thing that happened in a lone house in the Maine woods. Arthur Duryea, a young, handsome man, came to meet his father for the first time in twenty years. As he strode into the hotel lobby—long strides which had the spring of elastic in them—idle eyes lifted to appraise him, for he was an impressive figure, somehow grim with exaltation. The desk clerk looked up with his habitual smile of expectation; how-do-you-do-Mr.-so-and-so, and his fingers strayed to the green fountain pen which stood in a holder on the desk. Arthur took the pen and scribbled his name rapidly. Without a further word, neglecting even to get his key and own room number, he turned and walked to the elevators. Not until he reached his father’s suite on the sixth floor did he make an audible noise, and this was a mere sigh which fell from his lips like a prayer. The man who opened the door was unusually tall, his slender frame clothed in tight-fitting black. He hardly dared to smile. His clean-shaven face was pale, an almost livid whiteness against the sparkle in his eyes. His jaw had a bluish luster. “Arthur!” The word was scarcely a whisper. It seemed choked up quietly, as if it had been repeated time and again on his thin lips. Arthur Duryea felt the kindliness of those eyes go through him, and then he was in his father’s embrace. Later, when these two grown men had regained their outer calm, they closed the door and went into the drawing-room. The elder Duryea held out a humidor of fine cigars, and his hand shook so hard when he held the match that his son was forced to cup his own hands about the flame. They both had tears in their eyes, but their eyes were smiling. Arthur, looking into that glance, realized, with growing pride, that he had loved his father all his life, despite any of those things which had been cursed against him. He sat down on the edge of a chair. The mention of that name caused an unfamiliar chill to come between the two men. It stood for something, in each of them, which gnawed their minds like a malignancy. But to the younger Duryea, in his intense effort to forget the awful past, her name as well as her madness must be forgotten. Doctor Duryea closed his eyes slowly, as though an exquisite pain had gone through him. Henry Duryea nodded his head. His lips were tight together, and the muscles in his throat held back a cry. In that same soft tone of defense he spoke further, doubting words. “No, Dad—no!” Arthur shot to his feet. “I don’t believe it. I’ve never believed it. I know, as any sane man would know, that you are neither a vampire nor a murderer. You know it, too; and Cecilia knew it, only she was mad. He said the word in a curious hush of awed softness, as he had heard his Aunt Cecilia say it many times before. “You are affected, then?” asked Doctor Duryea bitterly. “Affected? Certainly I’m affected, but only as I should be at such an accusation. Cecilia was mad, I tell you. Those books she showed me years ago, and those folk-tales of vampires and ghouls—they burned into my infantile mind like acid. They haunted me day and night in my youth, and caused me to hate you worse than death itself. “Yes, I understand.” Henry Duryea threw his cigar into the fireplace, and placed a hand on his son’s shoulder. His voice ended abruptly, as if an age-long dread had taken hold of it. His son’s face was waxen, with sweat standing out like pearls on his brow. He said nothing, but his eyes were filled with questions which his lips could not put into words. His own hand touched his father’s, and tightened over it. Henry Duryea drew his hand away. He climbed to his feet and walked to the window which looked out over the street below. For a moment he gazed into space, silent. Then he turned and looked down at his son. Arthur Duryea passed a hand across his aching eyes. Those words, so often repeated by that witch of an aunt, stirred up the same visions which had made his childhood nights sleepless with terror. He could hardly bear to hear them again—and from the very man to whom they were accredited. “Your two young brothers actually died in their cradles, bloodless. And I stood trial in France for their murder, and my name was smirched throughout all of Europe with such an inhuman damnation that it drove your aunt and you to America, and has left me childless, hated, and ostracized from society the world over. “I must tell you that on that terrible night in Duryea Castle I had been working late on historic volumes of Crespet and Prinn, and on that loathsome tome,Vampyrs. I must tell you of the soreness that was in my throat and of the heaviness of the blood which coursed through my veins…. And of that presence, which was neither man nor animal, but which I knew was some place near me, yet neither within the castle nor outside of it, and which was closer to me than my heart and more terrible to me than the touch of the grave…. “I was at the desk in my library, my head swimming in a delirium which left me senseless until dawn. There were nightmares that frightened me—frightenedme, Arthur, a grown man who had dissected countless cadavers in morgues and medical schools. I know that my tongue was swollen in my mouth and that brine moistened my lips, and that a rottenness pervaded my body like a fever. “I can make no recollection of sanity or of consciousness. That night remains vivid, unforgettable, yet somehow completely in shadows. When I had fallen asleep—if in God’s name it was sleep—I was slumped across my desk. But when I awoke in the morning I was lying face down on my couch. So you see, Arthur, I had moved during that night, and I had never known it! “What I’d done and where I’d gone during those dark hours will always remain an impenetrable mystery. But I do know this. On the morrow I was torn from my sleep by the shrieks of maids and butlers, and by that mad wailing of your aunt. I stumbled through the open door of my study, and in the nursery I saw those two babies there—lifeless, white and dry like mummies, and with twin holes in their necks that were caked black with their own blood…. “Oh, I don’t blame you for your incredulousness, Arthur. I cannot believe it yet myself, nor shall I ever believe it. The belief of it would drive me to suicide; and still the doubting of it drives me mad with horror. “All of France was doubtful, and even the savants who defended my name at the trial found that they could not explain it nor disbelieve it. The case was quieted by the Republic, for it might have shaken science to its very foundation and split the pedestals of religion and logic. I was released from the charge of murder; but the actual murder has hung about me like a stench. “The coroners who examined those tiny cadavers found them both dry of all their blood, but could find no blood on the floor of the nursery nor in the cradles. Something from hell stalked the halls of Duryea that night—and I should blow my brains out if I dared to think deeply of who that was. You, too, my son, would have been dead and bloodless if you hadn’t been sleeping in a separate room with your door barred on the inside. Henry Duryea’s voice choked into a sob which brought the stinging tears back into his eyes. He paused to wipe his face, and to dig his fingers into his palm. “You understand, Arthur, that for twenty years, under my sworn oath at the Palace of Justice, I could neither see you nor write to you. Twenty years, my son, while all of that time you had grown to hate me and to spit at my name. Not until your aunt’s death have you called yourself a Duryea…. And now you come to me at my bidding, and say you love me as a son should love his father. He put his handkerchief back into his pocket and walked slowly to his son. He dropped to one knee, and his hands gripped Arthur’s arms. “My son, I can say no more to you. I have told you the truth as I alone know it. I may be, by all accounts, some ghoulish creation of Satan on earth. I may be a child-killer, a vampire, some morbidly diseased specimen of vrykolakas—things which science cannot explain. “Perhaps the dreaded legend of the Duryeas is true. Autiel Duryea was convicted of murdering his brother in that same monstrous fashion in the year 1576, and he died in flames at the stake. François Duryea, in 1802, blew his head apart with a blunderbuss on the morning after his youngest son was found dead, apparently from anemia. And there are others, of whom I cannot bear to speak, that would chill your soul if you were to hear them. He stood up, and his son stood up at his side. Henry Duryea’s tall stature, coupled with a slenderness of frame and a sleekness of muscle, gave him an appearance that was unusually gaunt. His son couldn’t help but think of that word as he sat on the rustic porch of the lodge, watching his father sunning himself at the lake’s edge. Henry Duryea had a kindliness in his face, at times an almost sublime kindliness which great prophets often possess. But when his face was partly in shadows, particularly about his brow, there was a frightening tone which came into his features; for it was a tone of farness, of mysticism and conjuration. Somehow, in the late evenings, he assumed the unapproachable mantle of a dreamer and sat silently before the fire, his mind ever off in unknown places. In that little lodge there was no electricity, and the glow of the oil lamps played curious tricks with the human expression which frequently resulted in something unhuman. It may have been the dusk of night, the flickering of the lamps, but Arthur Duryea had certainly noticed how his father’s eyes had sunken further into his head, and how his cheeks were tighter, and the outline of his teeth pressed into the skin about his lips. It was nearing sundown on the second day of their stay at Timber Lake. Six miles away the dirt road wound on toward Houtlon, near the Canadian border. So it was lonely there, on a solitary little lake hemmed in closely with dark evergreens and a sky which drooped low over dusty-summited mountains. Within the lodge was a homy fireplace, and a glossy elk’s-head which peered out above the mantel. There were guns and fishing-tackle on the walls, shelves of reliable American fiction—Mark Twain, Melville, Stockton, and a well-worn edition of Bret Harte. A fully supplied kitchen and a wood stove furnished them with hearty meals which were welcome after a whole day’s tramp in the woods. On that evening Henry Duryea prepared a select French stew out of every available vegetable, and a can of soup. They ate well, then stretched out before the fire for a smoke. They were outlining a trip to the Orient together, when the back door blew open with a terrific bang, and a wind swept into the lodge with a coldness which chilled them both. “A storm,” Henry Duryea said, rising to his feet. “Sometimes they have them up here, and they’re pretty bad. The roof might leak over your bedroom. Perhaps you’d like to sleep down here with me.” His fingers strayed playfully over his son’s head as he went out into the kitchen to bar the swinging door. Arthur’s room was upstairs, next to a spare room filled with extra furniture. He’d chosen it because he liked the altitude, and because the only other bedroom was occupied…. He went upstairs swiftly and silently. His roof didn’t leak; it was absurd even to think it might. It had been his father again, suggesting that they sleep together. He had done it before, in a jesting, whispering way—as if to challenge them both if they dared to sleep together. Duryea jerked back the door and stepped outside. The door slammed shut, and his footsteps sounded on the wood flooring of the porch. Arthur came slowly down the remaining steps. He saw his father’s figure pass across the dark rectangle of a window, saw the flash of lightning that suddenly printed his grim silhouette against the glass. He sighed deeply, a sigh which burned in his throat; for his throat was sore and aching. Then he went into the bedroom, found the razor lying in plain view on a birch table-top. As he reached for it, his glance fell upon his father’s open Gladstone bag which rested at the foot of the bed. There was a book resting there, half hidden by a gray flannel shirt. It was a narrow, yellow-bound book, oddly out of place. Frowning, he bent down and lifted it from the bag. It was surprizingly heavy in his hands, and he noticed a faintly sickening odor of decay which drifted from it like a perfume. The title of the volume had been thumbed away into an indecipherable blur of gold letters. But pasted across the front cover was a white strip of paper, on which was typewritten the word—INFANTIPHAGI. He flipped back the cover and ran his eyes over the title-page. The book was printed in French—an early French—yet to him wholly comprehensible. The publication date was 1580, in Caen. Breathlessly he turned back a second page, saw a chapter headed, Vampires. He slumped to one elbow across the bed. His eyes were four inches from those mildewed pages, his nostrils reeked with the stench of them. He skipped long paragraphs of pedantic jargon on theology, he scanned brief accounts of strange, blood-eating monsters, vrykolakes, and leprechauns. He read of Jeanne d’Arc, of Ludvig Prinn, and muttered aloud the Latin snatches from Episcopi. He passed pages in quick succession, his fingers shaking with the fear of it and his eyes hanging heavily in their sockets. He saw vague reference to “Enoch,” and saw the terrible drawings by an ancient Dominican of Rome…. Paragraph after paragraph he read: the horror-striking testimony of Nider’s Ant-Hill, the testimony of people who died shrieking at the stake; the recitals of grave-tenders, of jurists and hang-men. Then unexpectedly, among all of this monumental vestige, there appeared before his eyes the name of—Autiel Duryea; and he stopped reading as though invisibly struck. Thunder clapped near the lodge and rattled the window-panes. The deep rolling of bursting clouds echoed over the valley. But he heard none of it. His eyes were on those two short sentences which his father—someone—had underlined with dark red crayon. … The execution, four years ago, of Autiel Duryea does not end the Duryea controversy. Time alone can decide whether the Demon has claimed that family from its beginning to its end…. Arthur read on about the trial of Autiel Duryea before Veniti, the Carcassonnean Inquisitor-General; read, with mounting horror, the evidence which had sent that far-gone Duryea to the pillar—the evidence of a bloodless corpse who had been Autiel Duryea’s young brother. Unmindful now of the tremendous storm which had centered over Timber Lake, unheeding the clatter of windows and the swish of pines on the roof—even of his father who worked down at the lake’s edge in a drenching rain—Arthur fastened his glance to the blurred print of those pages, sinking deeper and deeper into the garbled legends of a dark age…. On the last page of the chapter he again saw the name of his ancestor, Autiel Duryea. He traced a shaking finger over the narrow lines of words, and when he finished reading them he rolled sideways on the bed, and from his lips came a sobbing, mumbling prayer. As in the case of Autiel Duryea we observe that this specimen of vrykolakas preys only upon the blood in its own family. It possesses none of the characteristics of the undead vampire, being usually a living male person of otherwise normal appearances, unsuspecting its inherent demonism. But this vrykolakas cannot act according to its demoniacal possession unless it is in the presence of a second member of the same family, who acts as a medium between the man and its demon. This medium has none of the traits of the vampire, but it senses the being of this creature (when the metamorphosis is about to occur) by reason of intense pains in the head and throat. 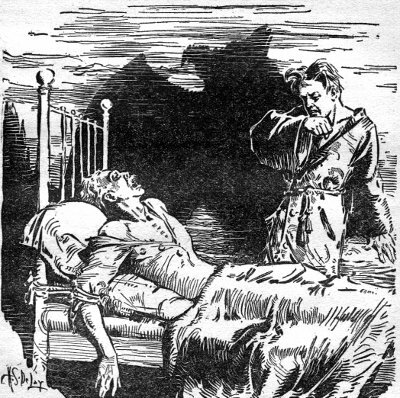 Both the vampire and the medium undergo similar reactions, involving nausea, nocturnal visions, and physical disquietude. When these two outcasts are within a certain distance of each other, the coalescence of inherent demonism is completed, and the vampire is subject to its attacks, demanding blood for its sustenance. No member of the family is safe at these times, for the vrykolakas, acting in its true agency on earth, will unerringly seek out the blood. In rare cases, where other victims are unavailable, the vampire will even take the blood from the very medium which made it possible. This vampire is born into certain aged families, and naught but death can destroy it. It is not conscious of its blood-madness, and acts only in a psychic state. The medium, also, is unaware of its terrible rôle; and when these two are together, despite any lapse of years, the fusion of inheritance is so violent that no power known on earth can turn it back. The lodge door slammed shut with a sudden, interrupting bang. The lock grated, and Henry Duryea’s footsteps sounded on the planked floor. Arthur shook himself from the bed. He had only time to fling that haunting book into the Gladstone bag before he sensed his father standing in the doorway. “No!” Arthur jerked himself away. He laughed. “It’s that French stew of yours! It’s hit me in the stomach!” He stepped past his father and started up the stairs. The words were hardly audible. Their glances met—clashed like dueling-swords. For ten seconds neither of them said a word or moved a muscle: Arthur, from the stairs, looking down; his father below, gazing up at him. In Henry Duryea the blood drained slowly from his face and left a purple etching across the bridge of his nose and above his eyes. He looked like a death’s-head. Arthur winced at the sight and twisted his eyes away. He turned to go up the remaining stairs. He stopped again; his hand tightened on the banister. “Yes,” breathed Arthur, and pushed up the stairs to his room. Doctor Duryea’s hollow footsteps sounded in steady, unhesitant beats across the floor of Timber Lake Lodge. Sometimes they stopped, and the crackling hiss of a sulfur match took their place, then perhaps a distended sigh, and, again, footsteps…. Arthur crouched at the open door of his room. His head was cocked for those noises from below. In his hands was a double-barrel shotgun of violent gage. … thud … thud … thud…. Then a pause, the clinking of a glass and the gurgling of liquid. The sigh, the tread of his feet over the floor…. Outside, the storm had grown into fury. Lightning zigzagged between the mountains, filling the valley with weird phosphorescence. Thunder, like drums, rolled incessantly. Within the lodge the heat of the fireplace piled the atmosphere thick with stagnation. All the doors and windows were locked shut, the oil-lamps glowed weakly—a pale, anemic light. Henry Duryea walked to the foot of the stairs and stood looking up. Arthur sensed his movements and ducked back into his room, the gun gripped in his shaking fingers. Then Henry Duryea’s footstep sounded on the first stair. Arthur slumped to one knee. He buckled a fist against his teeth as a prayer tumbled through them. Duryea climbed a second step … and another … and still one more. On the fourth stair he stopped. “Yes, Dad.” Bedraggled, his body hanging like cloth, young Duryea took five steps to the landing. “We can’t be zanies!” cried Henry Duryea. “My soul is sick with dread. Tomorrow we’re going back to New York. I’m going to get the first boat to open sea…. Please come down here.” He turned about and descended the stairs to his room. Arthur choked back the words which had lumped in his mouth. Half dazed, he followed…. In the bedroom he saw his father stretched face-up along the bed. He saw a pile of rope at his father’s feet. Speechless, his own pain piercing him with agony, Arthur fell to that grisly task. Both hands he tied—and both feet … tied them so firmly to the iron posts that his father could not lift himself an inch off the bed. Then he blew out the lamps, and without a further glance at that Prometheus, he reascended the stairs to his room, and slammed and locked his door behind him. He looked once at the breech of his gun, and set it against a chair by his bed. He flung off his robe and slippers, and within five minutes he was senseless in slumber. He slept late, and when he awakened his muscles were as stiff as boards, and the lingering visions of a nightmare clung before his eyes. He pushed his way out of bed, stood dazedly on the floor. A dull, numbing cruciation circulated through his head. He felt bloated … coarse and running with internal mucus. His mouth was dry, his gums sore and stinging. He tightened his hands as he lunged for the door. “Dad,” he cried, and he heard his voice breaking in his throat. Sunlight filtered through the window at the top of the stairs. The air was hot and dry, and carried in it a mild odor of decay. Arthur suddenly drew back at that odor—drew back with a gasp of awful fear. For he recognized it—that stench, the heaviness of his blood, the rawness of his tongue and gums…. Age-long it seemed, yet rising like a spirit in his memory. All of these things he had known and felt before. He leaned against the banister, and half slid, half stumbled down the stairs…. His father had died during the night. He lay like a waxen figure tied to his bed, his face done up in knots. Arthur stood dumbly at the foot of the bed for only a few seconds; then he went back upstairs to his room. Almost immediately he emptied both barrels of the shotgun into his head. The tragedy at Timber Lake was discovered accidentally three days later. A party of fishermen, upon finding the two bodies, notified state authorities, and an investigation was directly under way. Arthur Duryea had undoubtedly met death at his own hands. The condition of his wounds, and the manner with which he held the lethal weapon, at once foreclosed the suspicion of any foul play. But the death of Doctor Henry Duryea confronted the police with an inexplicable mystery; for his trussed-up body, unscathed except for two jagged holes over the jugular vein, had been drained of all its blood. The autopsy protocol of Henry Duryea laid death to “undetermined causes,” and it was not until the yellow tabloids commenced an investigation into the Duryea family history that the incredible and fantastic explanations were offered to the public. Obviously such talk was held in popular contempt; yet in view of the controversial war which followed, the authorities considered it expedient to consign both Duryeas to the crematory….